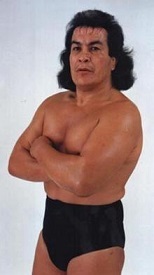 - CMLL 43rd Anniversary Show (September 24, '76) = Perro Aguayo lost a "Hair vs. Hair" Match to El Faraon. - UWA 7th Anniversary Show (February 14, '82) = Aguayo & Abdullah the Butcher won a "Three Falls" Match over Tatsumi Fujinami & Antonio Inoki. - CMLL 49th Anniversary Show (September 17, '82) = Aguayo won a "Hair vs. Hair" Match over Tony Salazar. - NJPW MSG Tag-Team League '82 (November/December) = Aguayo & El Canek competed in the league, which was won by Hulk Hogan & Antonio Inoki. - UWA 14th Anniversary Show (January 29, '89) = Aguayo, Dos Caras, Gran Hamada, & Villano III defeated Fishman, Kahoz, Rambo, & Zandokan. - CMLL 57th Anniversary Show (October 21, '90) = Aguayo, Fabuloso Blondie, & Konnan lost a "Three Falls" Match to El Hijo del Santo, Rey Mendoza, & Lizmark. - CMLL 58th Anniversary Show (September 8, '91) = Aguayo lost a "Triangular Hair vs. Hair" Match to Konnan. Cien Caras was the other participant. - AAA TripleMania I (April 30, '93) = Aguayo won a "Hair Vs Mask Three Falls" Match over Mascara 2000. - AAA La Lucha del Honor (November 12, '93) = Aguayo, Blue Panther, & Konnan lost a "Three Falls" Match to Eddy Guerrero, Jake Roberts, & Love Machine. - AAA TripleMania II-A (April 26, '94) = Aguayo, El Hijo del Santo, & Octagon won, via DQ, over Eddy Guerrero, Black Cat, & Love Machine. - AAA TripleMania II-B (May 15, '94) = Aguayo, Cien Caras, & Konnan won a "Three Falls" Match, via DQ, over Miguel Perez, Jake Roberts, & Love Machine. - AAA TripleMania II-C (May 27, '94) = Aguayo, Mascara Sagrada, El Hijo del Santo, & Lizmark won a "Three Falls" Match over Black Cat, La Parka, Psicosis, & El Satanico. - AAA Night of Champions (August 6, '94) = Aguayo & Vampiro lost a "Three Falls" Match to Jake Roberts & Konnan. - AAA When Worlds Collide (November 6, '94) = Aguayo won a "Steel Cage" Match over Konnan. - AAA TripleMania III-A (June 10, '95) = Aguayo, Konnan, La Parka, & Octagon defeated Cien Caras, Jerry Estrada, Mascara Ano 2000, & Pentagon. - AAA TripleMania III-B (June 18, '95) = Aguayo & Konnan lost a "Three Falls" Match to the UWA Heavyweight Champion, Cien Caras, and the IWC Heavyweight Champion, Mascara Ano 2000. The belts were on the line during the final fall. - AAA TripleMania III-C (June 30, '95) = Aguayo, Mascara Sagrada, Latin Lover, & Konnan lost an "Elimination" Match to Cien Caras, Jerry Estrada, Mascara Ano 2000, & Fishman. - AAA TripleMania IV-A (May 11, '96) = Aguayo & Konnan won a "Lumberjack" Match over Cien Caras & Pierroth Jr.
- World Wrestling Peace Festival (June 1, '96) = Aguayo & La Parka took down Cibernetico & Pierroth Jr.
- AAA TripleMania IV-B (June 15, '96) = Aguayo competed in an "Elimination" Match, which was won by Pierroth Jr.
- AAA TripleMania IV-C (July 15, '96) = Aguayo, Villano III, & Villano IV won, via DQ, over Cibernetico, Octagon, & Psicosis. - WWF Royal Rumble '97 (January 21) = Aguayo, Hector Garza, & El Canek beat Jerry Estrada, Fuerza Guerrera, & Heavy Metal. - AAA TripleMania V-A (June 13, '97) = Aguayo, El Canek, & Tinieblas Jr won a "Three Falls" Match, via DQ, over Gorgeous George III, Jake Roberts, & Killer. - AAA TripleMania V-B (June 15, '97) = Aguayo, El Canek, Cibernetico, & Octagon defeated Gorgeous George III, Fuerza Guerrera, Jake Roberts, & Cobarde Jr.
- AAA Verano de Escandalo '97 (September 14) = Aguayo Sr, Perro Aguayo Jr, & Heavy Metal won a "Steel Cage" Match over Sangre Chicana, Cobarde, & Picudo. Due to the loss, Chicana had his head shaved. - AAA Rey de Reyes '98 (March 1) = Aguayo won a "Four Way" Match over Electro Shock, La Parka II, and Cobarde, then lost in the final "Four Way" Match to Octagon. Latin Lover and Cibernetico were the other participants. - AAA TripleMania VII (June 11, '99) = Aguayo, Cobarde, & Octagon won a "Three Falls" Match over Perro Aguayo Jr, Sangre Chicana, & El Texano. - AAA Verano de Escandalo '99 (September 17) = Aguayo, Latin Lover, & El Canek defeated Sangre Chicana, Pirata Morgan, & Cibernetico. - CMLL Arena Mexico PPV (March 17, '00) = Aguayo, Rayo de Jalisco Jr, & Tarzan Boy lost a "Three Falls" Match to Mascara Ano 2000, Scorpio Jr, & Shocker. - CMLL Entre Torre Infernal (August 4, '00) = Aguayo & Villano III won a "Steel Cage Hair vs. Hair Elimination" Match over Mascara Ano 2000 & Pierroth Jr.
- CMLL 67th Anniversary Show (September 29, '00) = Aguayo, Rayo de Jalisco Jr, & Gigante Silva won a "Handicap" Match over Bestia Salvaje, Scorpio Jr, Shocker, & Zumbido. - CMLL Sin Piedad (December 15, '00) = Aguayo won a "Hair vs. Hair" Match over Cien Caras. - CMLL El Jucio Final (March 30, '01) = Aguayo lost a "Hair vs. Mask" Match to Universo 2000.